"Might as well face it, you're addicted to lead!" The ower of the Jetta that they came from is upgrading to a lithium pack. So in 4-6 years ForkenSwift will be on lithium? Nice score with the batteries. It's good to see people "recycling" them. Yeah - these are about 2.5 years old and have seen regular use. The OEM's are also talking about "repurposing" their EV lithium packs once they can no longer provide the desired range of the owner. I've read about them going into UPS/standby duty, or as storage for renewable energy. I'd wager in 10-15 years people who live in smaller cities/towns should be able to get good deals on used packs that will keep their OEM EV's humming, from other owners who demand more daily range and so have to replace them sooner & more often. ...Price: "core" rate of $15 per. Great! Now I have a reference price for 'Sold' used EV Batteries - since I 'Sold' a set of 18 Commercially used UPS batteries to a buddy for just $10 per - Power Battery AGM High Current Models - 44 lbs and 55 Ah! On another note - I would like to invite knowledgable EcoModders to my April 10, 2011 Event - Electricfly Aero Mods - The First electricfly Event - "Electricfly Aero Mods" - Fuel Economy, Hypermiling, EcoModding News and Forum - EcoModder.com - as Instructors, assistants, and exhibitors, as well as folks who just want to come out and check out electricfly and hang for a few hours! But I'm certain there's some underbody welding in the ForkenSwift's future. I'm concerned about the usual achilles heel of these cars: weakness in the mounting area of the front control arms. So just now for comparison sake I measured up the 3 Suzukiclones in my posession. 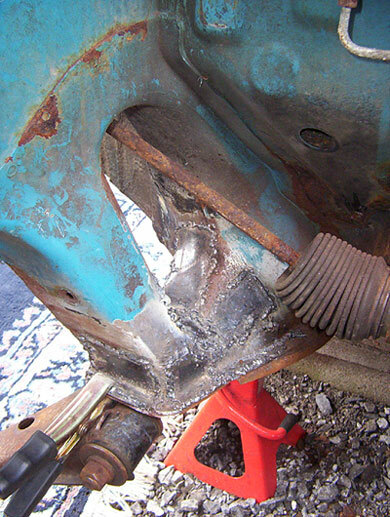 Checked the distance between the center of the forwardmost bolt/stud (the bolt/stud at the bottom of this picture, beside the welder ground clamp) holding the control arms, and they were all within 1/4 inch of one another. Not laser accurate measurement either, so I'd call these within specs, more or less. Darin - clean the paint around that rust, then apply raw white vinegar a few times over a period of a few hours with a normal paint brush (dab it on). It'll allow you to basically wipe the rust away, then you can clean up and oil/paint/coat whatever's still there. If you really have time, you can continue the vinegar treatment over a couple days, and it might save any sanding that you might be considering here. By all means, I'd get it fixed before it turns into an issue, and with rust, it's the sooner the better, ya know. EDIT: I should try to read more carefully. $6 for the entire fleet is in the budget! As a matter of fact, I was actually already reading your DIY lower brace bar post this morning. Topher: didn't know about the vinegar trick - thanks. Then it was pressed back into service hauling brush to the city compost yard - result of a big wind storm. It's really satisfying using it as a light duty hauler, especially the low speed maneuvering...I guess it's all low speed with this car . Forklift DNA ftw! !